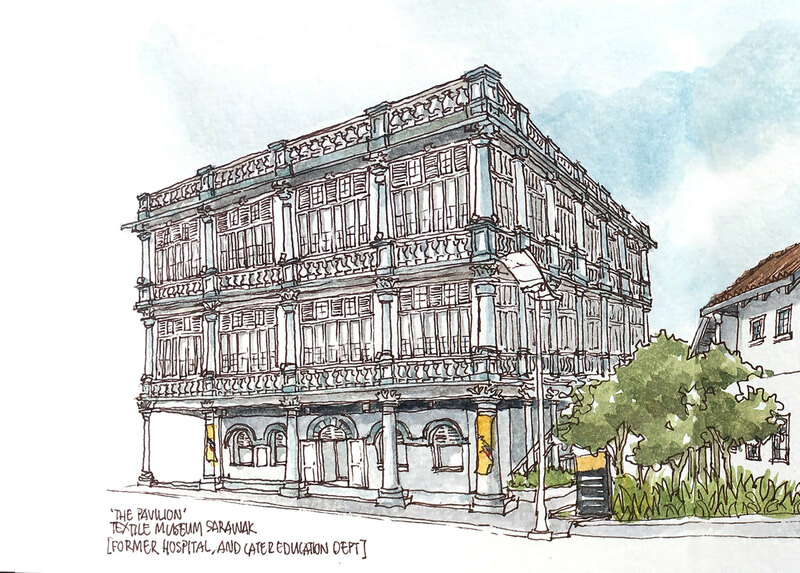 [By Peggy Wong in Kuching, Borneo] Recently, I had a guest urban sketcher in town and for an afternoon's sketch outing, I brought him to two heritage buildings right in the historical part of Kuching city. The Round Tower and the Pavilion that was sited next to each other, with complementing functions in its earlier days. The Round Tower is a distinctive building, built in 1886 following the devastating Great Fire of 1884 that razed much of the structures between Carpenter Street and Main Bazaar. 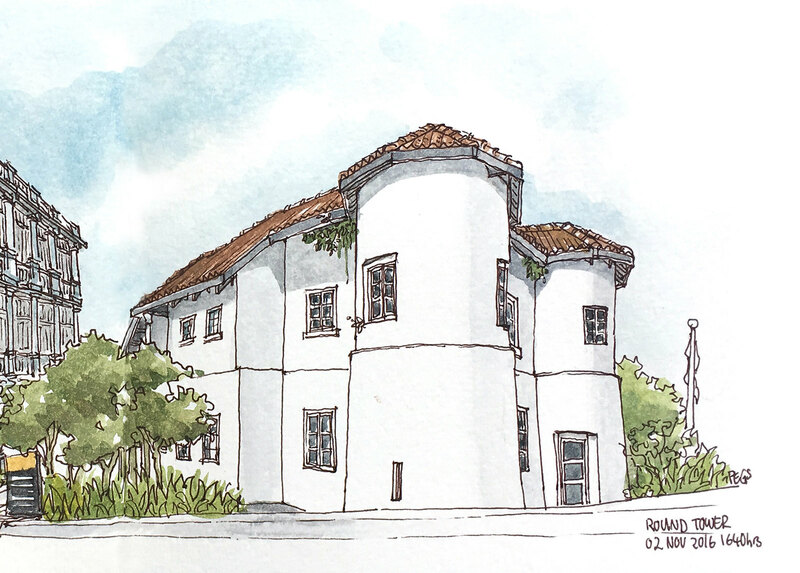 It was used as the town dispensary to complement the medical headquarters housed within The Pavilion next door. It is commonly believed that The Round Tower was a fortress, especially with its strategic location, appearance and the narrow windows; however, it never functioned as one. The building that houses the Textile Museum today, was called the Pavilion; originally constructed in 1907 as a medical centre. The ground floor housed the consultation room, a laboratory and offices, the first floor housed the hospital and the nurses quarters occupied the top floor. This building later became the headquarters of the Education Department in 1947 until the 1970′s, when it was given over to the Judiciary Department. The museum exhibits a visit-worthy collection of authentic local textiles and costumes made by the ethnic community of Sarawak; depicting the processes of the preparation of raw materials, weaving, costume motifs, accessories and wedding costumes.